Two weekends ago, we went peach picking to a nearby farm. They have a few different varieties but that day what was ripe was white peaches. My favorite kind! We got two bags full of peaches. We love peaches so we ate a lot of them but after my family left, for three of us to finish that many peaches was nearly impossible. So..Canning came to my mind. I have made jams before but I had no canning experience. Previously when I made jams, I have never used pectin. Seemed like a lot of jam recipes calls for pectin either powder form or liquid. So I actually bought a pack of powdered pectin but I just didn't feel like adding anything to the jam other than fruit and the sweetener, even though they say powdered pectin is a natural product. The way I have been making jam with natural pectin that comes out from whatever fruit I made jams with seemed to work just fine. And rather than sugar, I wanted to go a little fancier and healthier way, so I chose honey as sweetener. For some reason, canning seemed intimidating to me. But guess what, it was so easy! If you're prepared, it's really a piece of cake even for an impatient person like me. Here's a picture of my two little helpers hard at work. They absolutely loved picking peaches. At first my tot was more interested in counting the hay ride tickets but soon, he got the hang of it and he actually filled up his basket so quickly. I wish I thought of making the jam before my family left. Especially because my niece hand picked the peaches too! Maybe I should send a jar to them. 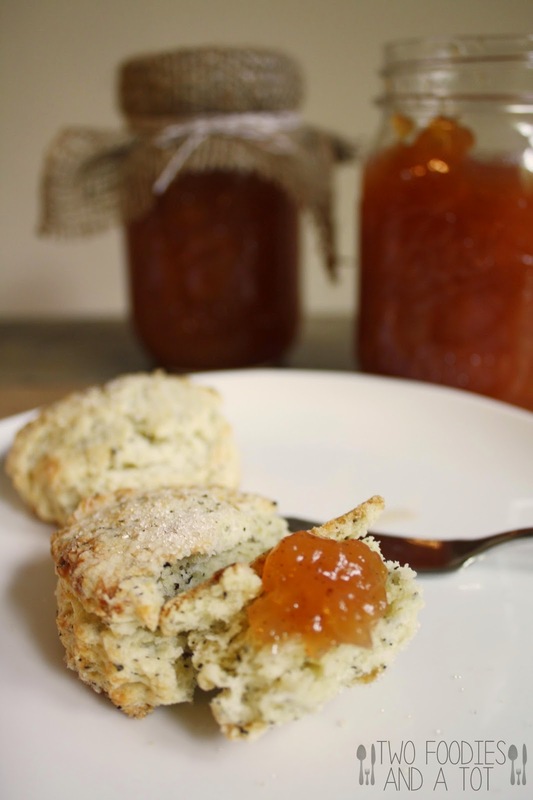 I baked some earl grey scones for my fellow earl grey lover friend last weekend and served some peach vanilla jam to go with them. Mmm. Making my mouth water. Earl grey scone will be posted next. 1. Prep the peaches. Wash the peaches and put them in a large mixing bowl or a pot and pour boiling water over it. Let it sit for a few minutes and wash with cold water. You will be able to peel the skin right off without a knife. 2. Dice the peaches and put them in a large pot and mix in honey and lemon juice. You can blend or mash the mixture to your liking if you don't want it too chunky. Let it sit for 15 minutes. 3. Split the vanilla bean and scrape the seeds from the pod. Add both seeds and pod in the peach mixture. 4. Bring the mixture to a boil. Cook on medium heat for 45 minutes to 1 hour(or until you get the consistency you like), stirring and mashing regularly. 5. 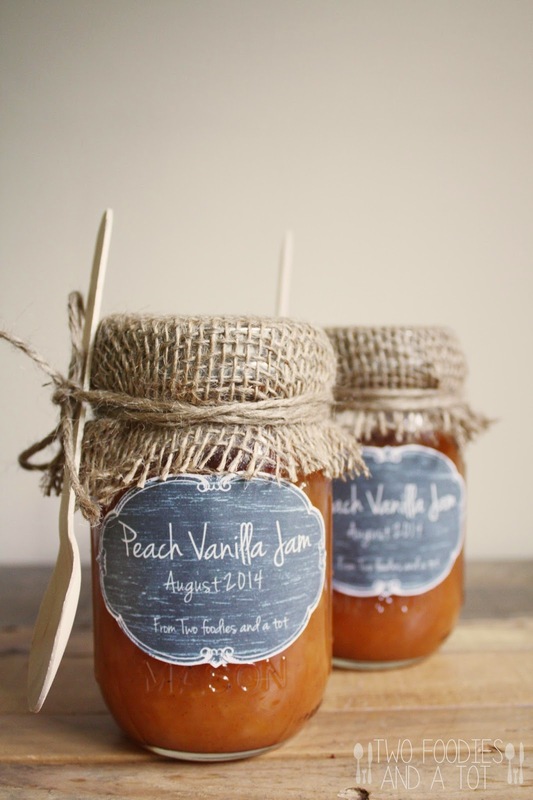 Place in jars and refrigerate or process for canning. * To check the consistency - Place a plate in the freezer, take it out when needed and place a small spoonful of jam on the cold plate. Check if you like the consistency. * Recipe adapted from Food in jars.